These ten orchids look surprisingly similar to many well-known animals. 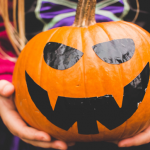 Continue reading, and you’re sure to smile at these flowers! Dracula simia orchids are native to South America. 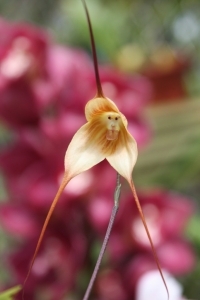 The name translates to “little dragon monkey,” an apt description of these monkey-faced flowers! Combined with their unique look, the orchids give off the distinct scent of fresh oranges. The perfect combination of flower and fruit! Added to the cute monkey faces and memorable smell, these flowers will bloom during any season, at any time. With over a hundred varieties, each one a different shape and color, Dracula simia orchids offer endless options for plant lovers around the world. From black to pink and every color in between, you can easily style your home or office with these flowers. Some varieties even have stripes or dots! This orchid is definitely one-of-a-kind. The blossoms resemble little naked men and, because these blossoms grow in clusters, the little men look like they are hanging. Hence the flower’s name: hanging man orchid. 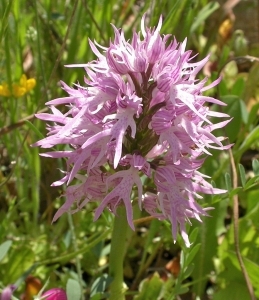 Another name for this flower is the Italian orchid, as it is a native of the Mediterranean area and surrounding regions. 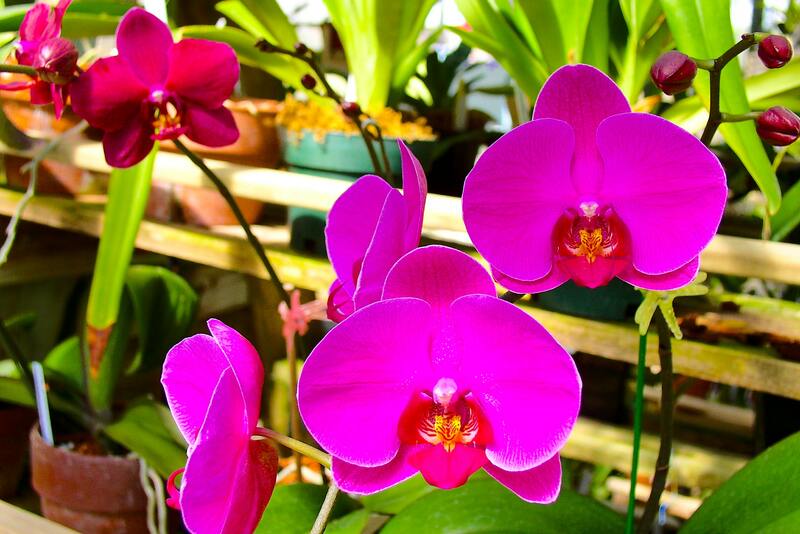 While the most common varieties come in shades of purple and white, you can also find these orchids in pink and yellow. They bloom during the months of March and April. 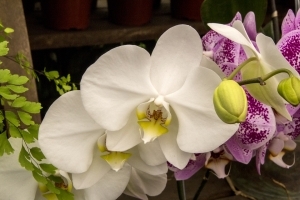 In addition to their aesthetic properties, these orchids can help with digestive and skin issues. Fun fact: In its native part of the world, the root of the hanging man orchid is made into a powder that forms the base of a popular drink, the Turkish Delight. What better animal to disguise a flower as than a bumblebee? 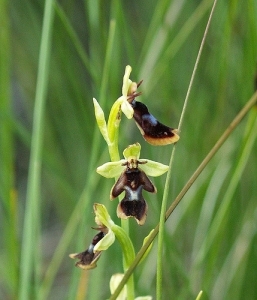 The ophrys bomybliflora is native to the Mediterranean and Eastern regions. Its large, oval green sepals paired with small bronze-colored petals are difficult to miss. These features makes the plant easy to identify. 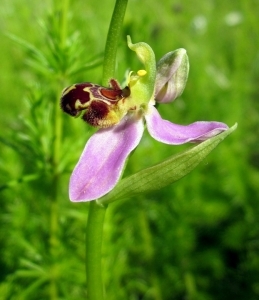 Unlike many other orchid species, the bumblebee varieties prefer sandy ground. If you happen to visit Portugal, you can find thousands of these flowers covering the coast. They love growing amidst the crushed seashells and in other wasteland areas. 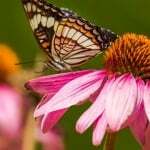 Of the orchids on this list, you are probably most familiar with this species: the moth or birdhead orchid. The flowers look like either animal, and the appropriate names just depends on where you live. 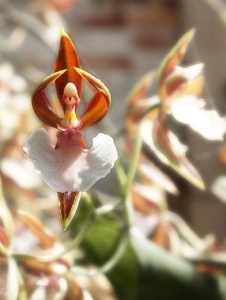 At a distance, the orchid imitates a moth in flight, but a closeup view of the flower looks like a bird with open mouth. If you have or know people who have orchids as houseplants, it’s likely they are growing some variety of a phalaenopsis. This is because birdhead orchids are easy to care for, making them the most common potted orchid species. Like the monkey face orchid, these flowers can grow year round. These are perhaps my favorite orchids on this list. They are so cute! Flying duck orchids, caleana major, look exactly like the name: little purple, red, and green ducks in mid-flight! These flowers are famous in their native land, Australia, appearing on that country’s postage stamps. 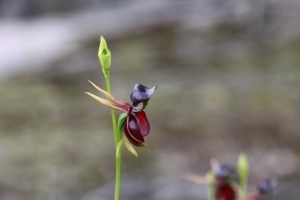 Sadly, flying duck orchids also made it onto Australia’s vulnerable plant list, as habitat destruction has caused a marked decline in reproduction. blossoms, you’ll have to travel to Australia. This is because the orchids’ roots have a symbiotic relationship with a type of fungus only found in that country. Who knew? Maybe one day, someone will find a way to grow flying ducks outside Australia. Until then, have fun looking through pictures on Google! Peristeria elata is an eye-catching flower. The blossoms cradle a small, picture-perfect white dove. Also known as the Holy Ghost orchid, the plant is native to Central America and some parts of South America. 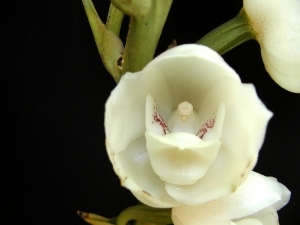 In fact, dove orchids are the national flower of Panama. The ‘Flor del Espiritu Santo,’ once abundant in Panama, is so popular in the country that it is now an endangered plant. prim, Holy Ghost flower gives off the scent of alcohol. A one-of-a-kind combination. 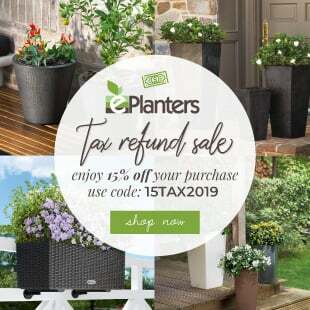 In addition to being a sought-after houseplant, this plant is featured in Chinese medicine and has numerous cosmetic uses. Another Australian native, the ballerina orchid earned its name due to its uncanny resemblance of a graceful dancer on pointe. The flower completes the effect by clothing the ballerina in a light pink and white tutu. Caladenia melanema have a short blooming season from August to mid-September. 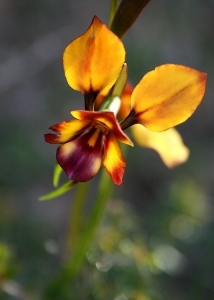 They also happen to be extremely rare, growing only on Lake Altham in the Mallee region of Western Australia. Local rabbits and kangaroos pose a problem to these delicate plants, as they carelessly graze in the flowers’ natural habitat. Originating in the Eastern countries of China, Russia, Korea, and Japan, the habenaria radiata imitates a crane mid-flight. Also known as the fringed orchid, crane orchid, or Sagiso, this flower is the most famous orchid in Japan. Sadly, like several other orchids on this list, white egret varieties are quickly becoming an endangered species. 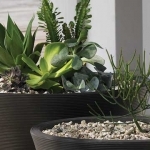 They are also not the most easy to grow outside their natural habitat, making it difficult to preserve these beautiful plants. 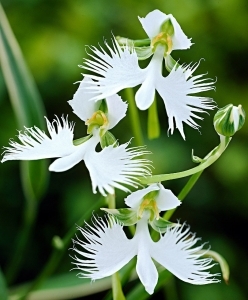 Many Japanese orchid collectors have taken it upon themselves to protect habenaria and care for them in private gardens on mountain regions or bogs, some allowing public viewing of the flowerbeds. The name of this plant combines two Greek words, di and ouris, which translate as “two” and “tails,” respectively. Looking at this flower, you understand the name. The hanging petals are perfect reflections of a donkey’s floppy ears! With a breeze swinging the petals to and fro, you can almost hear the harsh braying of the animal. I would highly recommend taking a trip to Australia, as it is the home of this species of orchids as well. Donkey orchids liberally clothe the grasslands, woodlands, and rocky outcrops. I have to say, the next orchids on the list are probably not what you would consider pretty. Why? Because the blossoms resemble that pesky insect: the housefly. Not only does the flower look like a fly, but it also depends on the insect for pollination. And because flies are such an abundant species, ophrys insectifera has become a widespread orchid across Western and Eastern Europe. 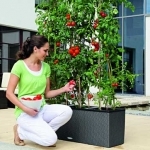 You can find varieties of the plant from Ireland to Italy, from Portugal to Poland, and most places in between.